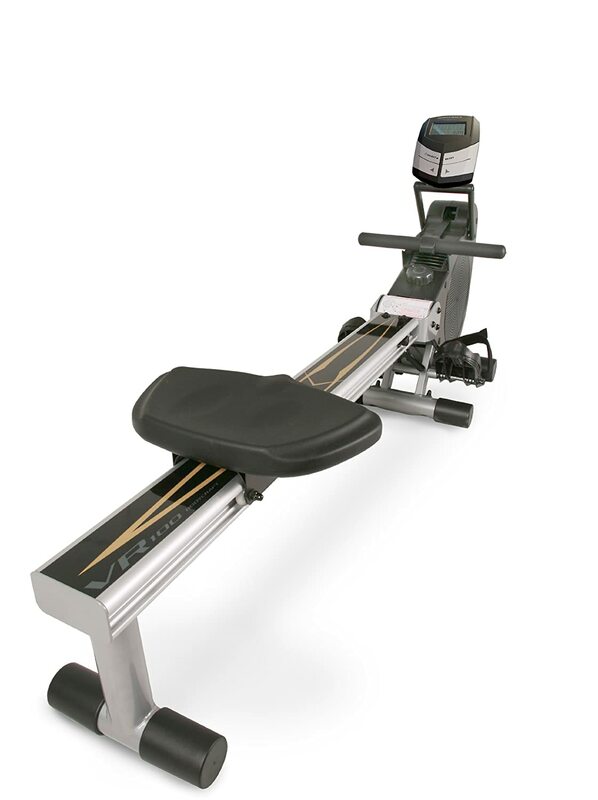 The BodyCraft V100 Rowing Machine is a rower with six distinct levels of resistance. One is for air resistance only, and the other five are for both magnetic and air resistance. Seats are designed for efficiency to keep comfort maximized and physical effort constrained to workout purposes. Rollers also keep everything working efficiently. This rower made it to one of our top picks of the best rowing machine for this year. The machine is made of aluminum that is aircraft-grade, and its frame is made from steel. There are 44 inches from the pedals, so that people of various heights can use the machine and adjust it to their need. The console used to measure users’ statistics such as distance, time, strokes, heart rate, and number of calories burned can also be adjusted to acclimatize the height and angle desired. At 17 x22 x68 inches and 70 pounds, the machine can be folded up when not in use and stored easily. The current price at Amazon.com is $590.00 including free shipping. Upper body, core, and cardio workout is intense and complete. Easy storage means this complete workout is available without the need to go to the gym. Console is nearly exhaustive with all necessary statistics for exercise. Six levels of resistance allow adjustment of intensity so that workout is based on individualized goals. Differing levels of resistance helps customers base their exercise upon their current level of physical fitness and needs therein. Resistance level adjustment also ensures that users with various physical limitations to adjust accordingly to avoid pain. Knees and hips are not impacted, so it is excellent for people with joint injuries or rheumatoid arthritic pain. Rowing motion of the machine is representative enough of actual rowing to encourage an excellent cardiovascular workout program. Customers commonly refer to the BodyCraft VR100 as the best value of all rowing machines on the market they investigated. The aesthetics of the machine are commonly commented upon, as it can fit well in a home without becoming an eyesore and stored easily when necessary. All pulling action builds gradually, so there is no risk of pulling muscles from unexpectedly fast pull action. The product is extremely helpful for strength training. The system is compatible with other monitors, so if there is a problem with the console (see below), there are options available. The fan can be quite loud, and there is no opportunity for adjustments of the fan’s operation or volume. Customers commonly question the accuracy of aspects of the console’s measurements. The console has seemed to have a limited life span, approximately three years, with its accuracy beginning to decline soon after purchase. Some users report difficulty with customer service when product problems arise. The service is outsourced, and their phone number is not always answered; voicemails are reportedly returned exceedingly slowly if at all. Although the machine folds up for easy storage, its initial setup involves significant assembly, and the directions available in the manual are thought by many to be unclear at best and inaccurate at worst. 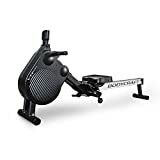 BodyCraft VF100 rowing machine is an excellent choice for home use. The high level of workout available at a gym can be achieved in the home with this product. It is $200 less expensive than the Concept2 Model D, which is a popular rower among enthusiasts. The various workout options make it customizable for all personal goals and needs. The machine is manufactured to simulate rowing action, hence a smooth workout that is both rigorous and safe, but needs to be only as rigorous as the user feels ready for. While the console has caused problems for some, the cost of the BodyCraft, being as much as $200 less than other similar products makes it worth purchasing the BodyCraft and a cheap heart rate monitor ($50 at most) to connect to it. Therefore, the positive exercise qualities of the machine will not be compromised and the limitations of the console are easily compensated for while still paying significantly less than for other products offering the same type of workout.